Do you know if you can buy them? I'm not talking about just buying the ones that others sold. I mean they just sell them all the time, does anyone know? Thanks. 1 Rusty Spear + 1 Sharpening Stone = 1 Tarnished Spear. 1 Tarnished Spear + 1 Flask of Water = 2 Pieces of Ore. 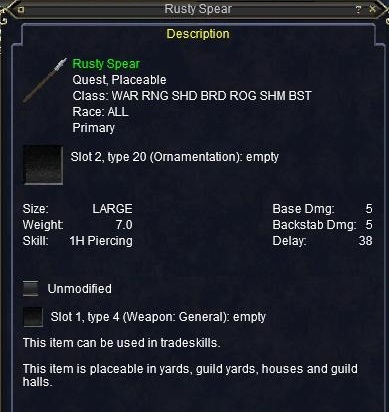 I will pass on more recipes if I find any on other Rusty Weapons. By the way, Tarnished weapons dont sell for more, but they have a smaller delay between attacks, at least on Stromm in Queynos. do tarnished weapons sell more to vendors than rusty ones???? ?